Greetings, BEST FRIENDS. 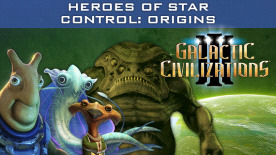 The Tywom - and other exciting alien species from the Star Control®: Origins™ universe - have come to Galactic Civilizations III! Each alien race brings a new depth of play with unique leaders, ship designs, traits, music and more. The Star Control Heroes DLC pack introduces the Tywom, Mowlings, Mu'Kay, and Free Trandals into Galactic Civilizations III. All of the new major alien factions come equipped with a unique leader, ship designs, music, and traits that make sense for that race. Tywom - Hello, best friends! These yellow slug-like aliens would like a hug. They're slimy, and you don't want to give them one, but still - it's all they really want. The Tywom want to be friends with everyone, which makes them great diplomats, and their constant desire for approval gives them a bonus for any other factions who happen to love them. Mowlings - All hail the mighty Jeff! The Mowlings are small, bear-like creatures who worship a mysterious deity they call Jeff. Frankly, they're a little lost without him, so they spend their time finding new ways to worship him. The Mowlings get a special Temple of Jeff improvement (one per planet) that grants bonuses to influence and approval, and in return Jeff orbits their planets protectively. Mu'Kay - Greetings, federation member! Founders of the Federation for Allied Species, the Mu'Kay are intelligent cephalopods who live entirely in aquatic environments. Their natural intelligence makes them excellent researchers, and their polite (if occasionally condescending) manner lends itself well to diplomacy. Unless you're a fish. Then prepare to be eaten.